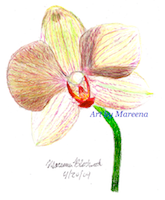 Single flower butterfly orchid color pencil drawing emphasizing the beautiful red (flower part). Five petals detail the lines and bright colors of this delicate butterfly orchid. A long green stem curves beneath the petals. Butterfly is a nickname for Dendrobium orchids that come in a wide assortment of colors.